This romantic scratch card game contains a “Love” theme and the symbols depicted include Cupids, Angels, Flowers and Hearts. This scratch card game is very popular as it allows player to win some great prizes. 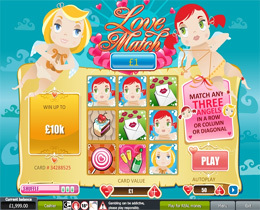 Love Match Scratch Card can be played either for free or for real money. The free version is ideal for beginners as it allows players to form a better understanding of the game and how to play it. However, only gamblers that play for real money will qualify for the cash prizes. There are nine boxes on the scratch card panel, and players start the game by choosing an amount to bet. The bet amounts in this game vary between $0.50 and $10. Once the bet has been placed the player will have to scratch the panels on the card. Once all the panels have been scratched, the player stands the chance to win up to $100,000 when they have three angel symbols lined up in a single row.